Fairfield Warde’s J.J Conway goes up for a layup during the FCIAC all-star Thursday at Staples High School in Westport. No matter what the teacher called them, the two Nicks became fast friends, remaining so even as one moved out of town. Coaching the FCIAC senior varsity team, Trumbull coach Buddy Bray was faced with a similar dilemma as he coached the Western Division All-Stars. Bray opted to just run plays called “Nick” and see which player responded. The two joined seniors and juniors from every other team in the FCIAC in the second annual FCIAC Junior/Senior All-Star Games at Staples on Thursday night. The East won the up-tempo senior game 117-116 on a deep 3 at the buzzer by Darien’s Zak Swetye. Swetye scored 32 points leading the East. Marcus Fox scored 33 points to pace the West. New Canaan senior Tyler Sweeney, who is headed to play Division III ball in California at Occidental College, played for the east. In the junior game, the Eastern Division won 138-120. Trinity’s Dutreil Contavio scored 23 points, leading a balanced attack for the West. Max Sussman of Staples knocked down 11 3-pointers, scoring a game-high 35 points for the East. Laudati moved out of Stamford soon after nursery school, but his parents stayed close with the Laveris family as the two students moved through different school systems. The two friends have played against each other many times on the court and the baseball diamond, but never got to be teammates until Thursday when they both suited up for the Western Division. 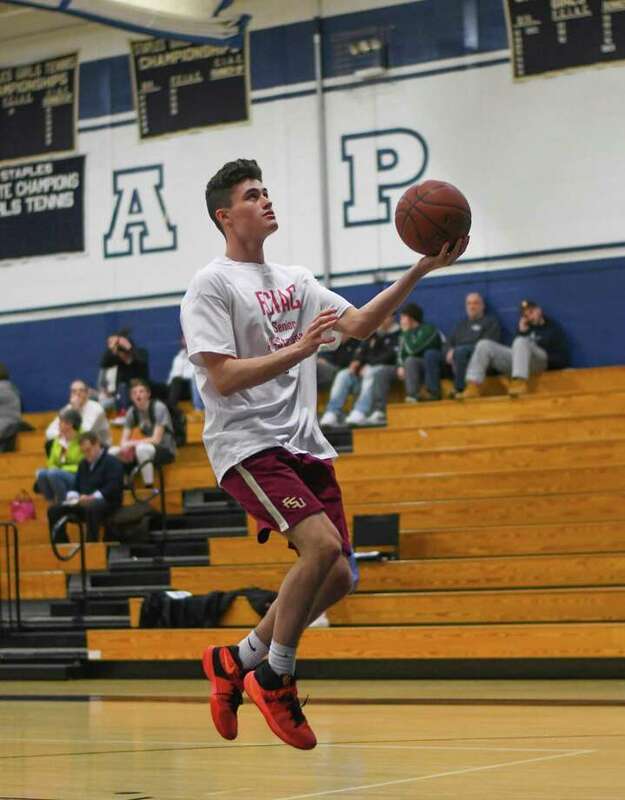 Laudati, who won a FCIAC title with Ridgefield, said getting to play in an all-star game is a fun way to end the year and getting to play with his old buddy made it even better. The pair of friends joined all the seniors in their last night on a FCIAC court with smiles, a little friendly trash talk and plenty of dunks and long 3s.